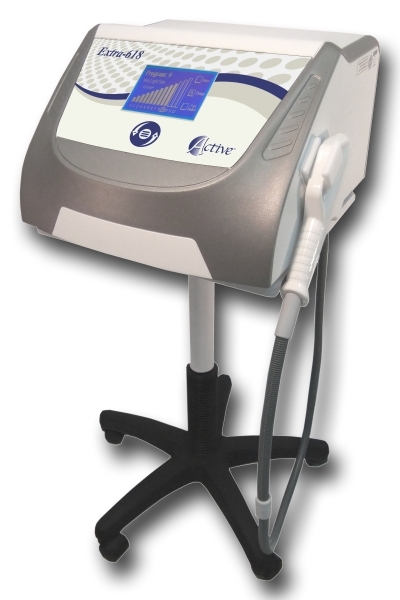 Extra - 618 (Crystal) is a lightweight and portable desktop unit suitable for easy transport between clinics. It is highly suitable for dermal - aesthetic treatments like Acne, Skin Rejuvenation, Hair Removal and more. The Extra - 618 (Crystal) is the second generation of the GEM-PL Technology Crystal	Series and combines the simplicity of the Crystal Series with the sophistication and knowhow accumulated from hundreds of Crystal users over the years. All these bring superb results with minimal maintenance costs. The Extra - 618 (Crystal) is equipped with a large Graphical LCD that provides real-time information and guidance to the user. Operating this sophisticated device is done with 3 push	buttons only, leaving much space for the experienced Practitioner to adjust the right treatment program for the specific patient. The Extra - 618 (Crystal) has passed the tests of the European medical safety standard of IEC 60-601-1, and was awarded with the medical CE 0483 by MDC. The Extra - 618 (Crystal)	is approved by the FDA, CSA and by the governmental health CFS certificate.